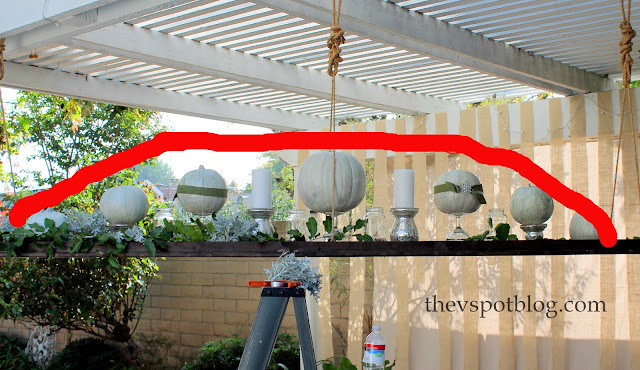 Yesterday I did a wrap up of our Thanksgiving dinner and decor, but I wanted to share how I put together the hanging centerpiece before I move on to all things Christmas. There are no rules here. I mixed yard clippings with rhinestones and mercury glass with mason jars… it all worked together. I explained how easy this shelf was to build, but it is even easier to create a beautiful display with items you already have in your house or in your yard. I started with several of the real pumpkins left over from Halloween, which I had upcycled and blinged out with Tori Spelling jewelry pieces. The first step was to get the basic shape you’re going to design around. I wanted it to be higher in the middle than on the ends, so I used assorted candle holders or glasses to elevate the pumpkins to the height I wanted, creating kind of an arc. Once I had the basic shape that I wanted, I could start filling in the centerpiece. I am not exaggerating when I tell you that every single bit of greenery used was clipped out of our yard or off of our trees that very morning. 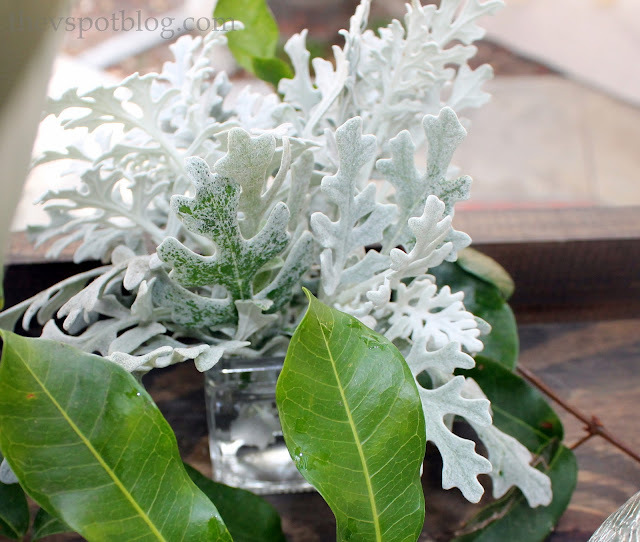 I clipped Dusty Miller (because there’s plenty of it and because it coordinated beautifully with the pumpkins), clipped little branches from trees, a few vines here and there… basically just a nice palette of greens. I started layering the flat leaves around the glassed and candle holders, covering most of the wood. I ran these, evenly spaced, all along the edges of the “shelf”. Once the little votive vases of the Dusty Miller were in place, then I added more greenery to fill in any gaps and topped the whole thing with a few strips of burlap. So aside from the pumpkins (which I slowly bought over the months of September and October) I had everything I needed to pull this together. 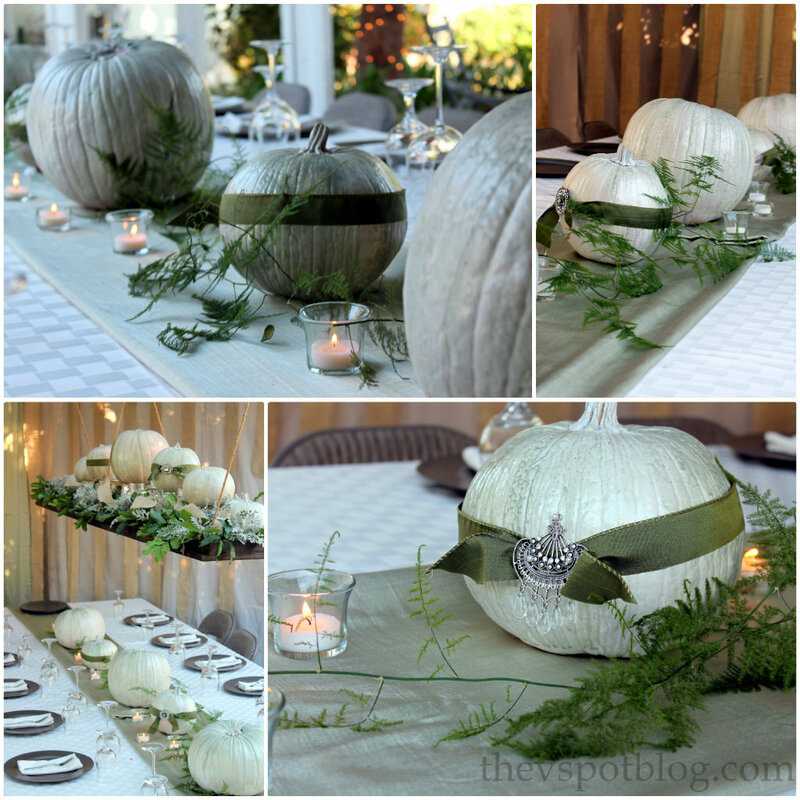 Think beyond Thanksgiving… As long as you stick with a simple color palette, you’ll be fine. What do you have that you could mix and match to create something beautiful? Simple, elegant and the price is definitely right. I wish we could have an outdoor space like that for the winter days here. Just too darned cold.